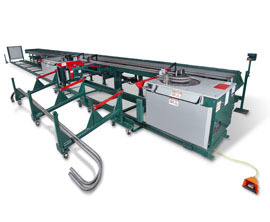 The Magnabend 211 R is capable of bending two #11 -35mm bars at one time. This automated bar bender has a 990 mm center distance. The 211 R has Fully automated center supports that retract or stay out to support the bar as needed. The machine grips and guides the bar during the bending process keeping the operators hands free of pinch points and eliminates 2-3 man bending. The Magnabend 211 R has improved controls that speed set up and reduce operator errors. The machine has stow-away tooling trays to prevent trip hazards, a light curtain prevents operators from entering the area while the moving bender travels and, air assisted and lighter tooling to reduce operator strain.